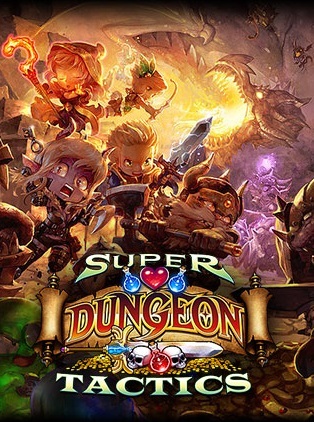 Super Dungeon® Tactics is a tactical turn-based game in which players create a guild of Heroes to combat the Dark Consul’s forces throughout Crystalia. As the guild master you choose to take on bounties, answer the pleas of the public, or answer a noble call to adventure. Whether for altruistic reasons, just getting your cut, or a little of both, complete quests, gather loot, attract Heroes, and reveal the world of Crystalia by your own means. Each Hero brings a unique set of abilities to the guild, and it is up to you to choose wisely which Heroes you will send to complete each adventure. Before setting out, configure the Heroes with equipment and abilities to fit your unique play style and meet the challenges of the upcoming adventure. Explore ever-changing dungeons and battle hordes of monsters in your adventures. The party must react to the tides of battle by assigning randomly rolled ability dice to each Hero. Each assigned result can unlock potent abilities. It’s up to you, and a little luck, to use them to their fullest potential. After battle, enjoy the spoils of adventure, by discovering new loot to upgrade the capabilities of the Heroes, and provide them with new unique abilities and game effects.lely in your hands. Will you save humanity or will you doom us all? Familiar turn based strategy game with light amount of randomness provides a good balance of strategy and chance. In Super Dungeon® Tactics, every round provides a new challenge. Each hero has a unique die that changes with their equipment and represents the heroes influence on the battle. The Dice enhance character stats and provides access to special abilities during each round. Acquire loot and build up your heroes through main story missions, unique side quests and random bounties. Unique level objectives, wide variety of enemies and unexpected hero party situations will constantly provide new challenges. With progression tied to loot, no more heroes are left behind. Swap equipment around and bring heroes anywhere without worry of underleveling.